Okay, that’s a cheesy title, but it’s true! As big time board game enthusiasts, we are never “bored” when it comes to unplugged fun with friends or our two year old! Definition: any game played on a board, especially one that involves the movement of pieces on the board, such as chess or checkers. 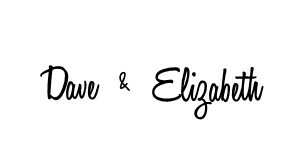 Growing up, this term had a very different meaning for me than it does now, some twenty years later. Back then we would play the “classics”: Chess, Checkers, Monopoly, Life, Sorry, Clue, Risk, Stratego, Battleship and the board/card game Sequence. I still remember thinking that girls were gross when I was forced to get married in the game of Life… or fill a mini van with 4 crying babies…I mean come on, how many times can you have twins!? All of them had their unique strategies in how you played them and all were equally fun. I went along, growing older and not really playing board games as much when the dawn of video gaming consoles happened right around my teen years. Every time we would play a game I would sense that while it was still fun, it wasn’t the same excitement I had when I first played. I still enjoyed playing because I was doing something with people that I loved, but I also started realizing that the games were too similar to be thrilling. I wanted more adventure and more mystery. It all started one night when Elizabeth’s uncle was talking about this new store that had opened nearby selling board games… I was like huh, interesting. A store that sells things like Monopoly games and different Risk and Clue variations…wonder how they stay in business? I mean they’re fun and all but I wouldn’t open a store to sell those games…can’t you get them at department stores? 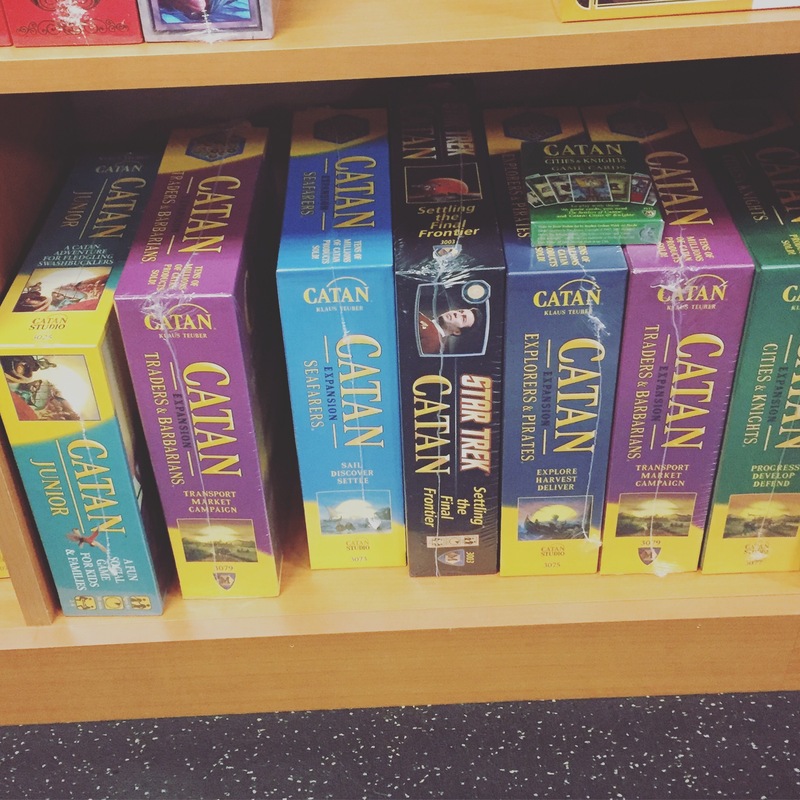 I was a little perplexed by the idea of a store that sold board games alone. He went on and described that they had a library allowing you to rent a board game and play before you bought or just to play in store. Just like a book library. I was still skeptical but it sounded like an interesting spot to see so we decided we would go the next day. If you haven’t guessed by now, the game was Carcassonne; a German tile game based off of the fortified city in southern France. On your turn, you pick a tile from the stack and place it on the “board” wherever you decide and you get to choose what you do with your Meeples. You have the choice of respectable farmer, knights to protect the cities, robbers on the roads, or monks in the monastery. All give you various points based on their function. I had never played such a fascinating board game that effectively changed every time you played it! I was ready to see this store that had more games like Carcassonne! Although at that point, I had a hard time conceiving of any game better than Carcassonne. The next day we drove to Blue Highway Games in the Queen Anne district of Seattle. We pulled two games from the library and sat down to play. Ra‘ and Ticket to Ride. 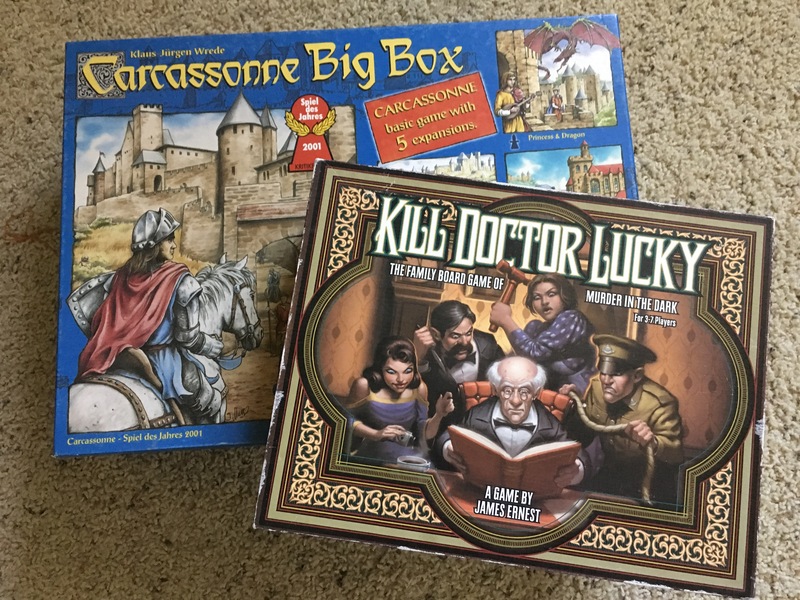 We played a handful of other games that trip including Kill Dr. Lucky, which further sparked my interest in these new found games. We ended up buying Carcassonne and Kill Dr. Lucky on that trip. They were the very first games in our collection. Our friends and families back home soon fell in love with these games as much as we did. My brother-in-law enjoys choosing and giving us board games every year for Christmas, which effectively grows our collection regularly. Many of our friends in our new hometown on the coast have also caught the bug. 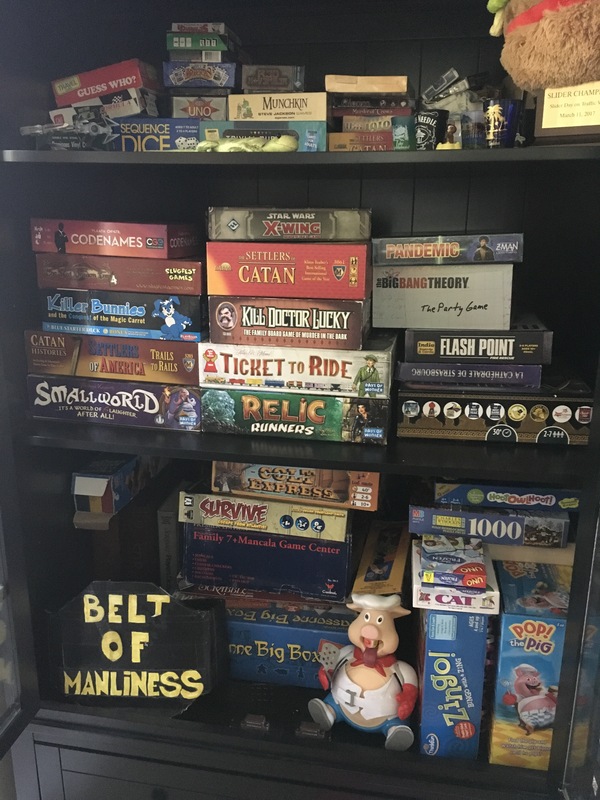 As our collection has grown and our love of board games has spread to our family and friends, we get to see all these people get excited over games and see their collections grow. 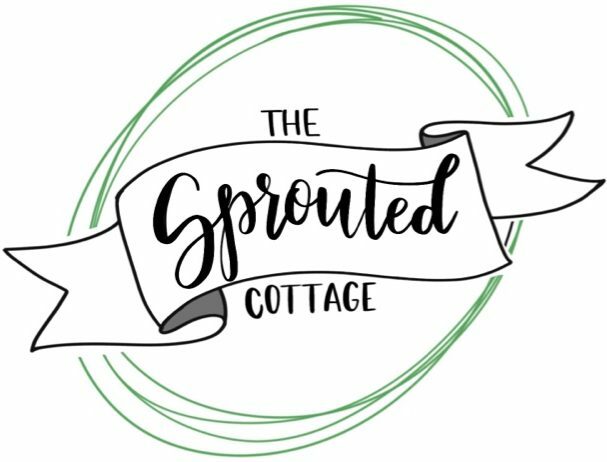 Now, we get the fun adventure of building a collection for our Sprout! 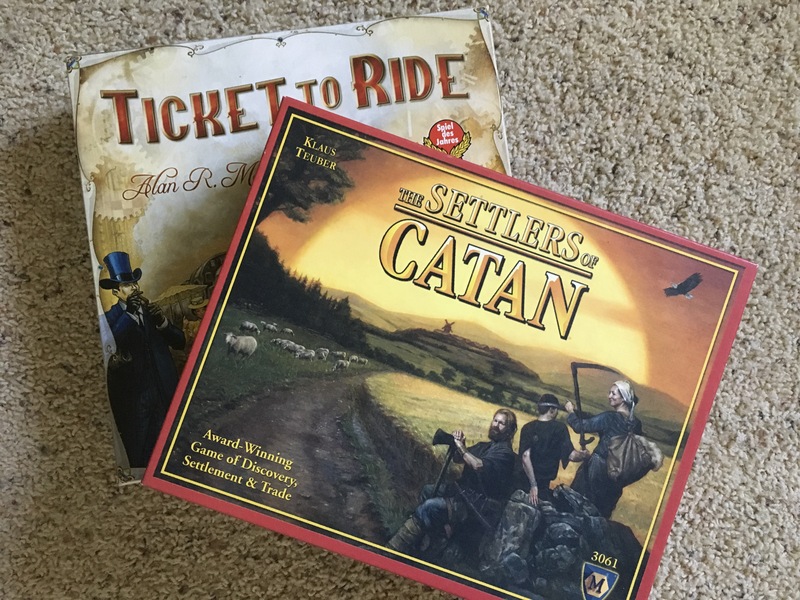 We have been back to Seattle twice since then and each time we discover a new facet of the board gaming industry and we come back with more games in tow. 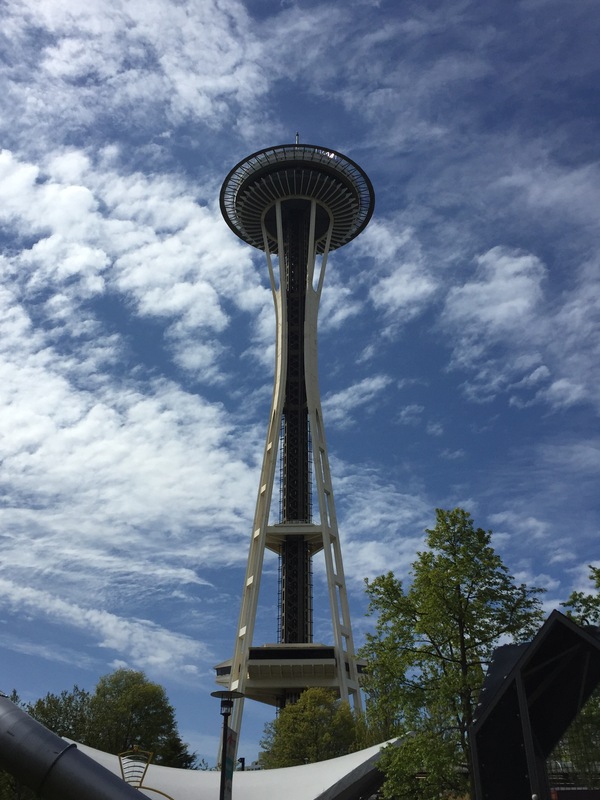 The game shops have multiplied in the Pacific Northwest and now include more elaborate establishments. Think, cafés attached to the libraries; tournament rooms; full service restaurants offering gourmet choices as well as local beer and wine. Two of our recent stops were Meeples in West Seattle and Mox Boarding House in Bellevue. We’ve seen everyone from older couples with grandkids to college students on a study break. There is literally something for everyone. We have just a few games! We also upgraded our first Carcassonne edition with the “Big Box Collection” which has quite a few expansions. That’s the beauty of these games. They are so uniquely engineered that most games come with multiple expansions or versions to change the way the game plays out. The possibilities are almost endless! It’s always exciting to see what’s new and upcoming but still satisfying to pull out our very first game and play a round because no matter how many times you play, it’s never the same and that’s what we love about these kind of games. As I said before, there is something for everyone. Whether you’re super cutthroat/competitive in nature, more on the friendly/cooperative side, or somewhere in the middle, there is a game for you. Games are becoming more and more mainstream. You’re now able to pick up games at regular department stores, but I almost always go back to the local sources. They created my love for these games and I feel that it’s important to support local businesses and passions as much as I can. However, if you are on a budget, you can find some of them at online retailers. So, grab your family or friends and go play a board game! A Eurogame, also called a German-style board game, German game, or Euro-style game, is a class of tabletop games that generally have indirect player interaction and abstract physical components. Euro-style games emphasize strategy while downplaying luck and conflict. They tend to have economic themes rather than military and usually keep all the players in the game until it ends.